Information We Collect. Dentons may ask for and collect from you personally identifiable and other information at certain points throughout the Website. Depending on the information and/or services you request, you may be asked to provide your name, email address and other information. In addition to the information you knowingly provide, Dentons collects the domain names and IP addresses of its visitors, along with usage statistics (e.g., types of web browsers and operating systems used) and browsing history. This data is used to more efficiently operate Dentons’ business, promote our services and administer the Website. Dentons may combine this information with the personally identifiable and other information it collects.Dentons also collects any information you may choose to provide in your communications with us. Please do not send us any confidential information until we have confirmed in writing that we represent or act for you. Unsolicited emails from non-clients do not establish a lawyer-client relationship, may not be privileged, and may be disclosed to others.Dentons collects or has access to personally identifiable information that you provide to third party services offered through this Website, such as Campaign Monitor. Dentons does not collect personally identifiable information about your online activities over time and across third party websites or online services. Information Sharing with Third Parties. Dentons may disclose your personally identifiable information to another entity (i) for purposes of outsourcing one or more of the functions described in the previous section; (ii) to confirm or update information provided by you; (iii) to inform you of events, information about our services, and other important information, or (iv) for other purposes disclosed at or before the time the information is collected. If you tell us you wish to attend an event, your name and organization may appear on a list which we provide to other delegates at the event. We may also share your information when legally required to do so. How We Protect Information. Dentons attempts to protect against the loss, misuse and alteration of your personal information. Dentons has implemented reasonable administrative, technical and physical measures to protect your personal information. How You Can View Or Update Your Personal Or Financial Information. To ensure that you have as much control over your personally identifiable and other information as possible, you may update your information by contacting us as provided in the “Contacts” section below. We will use reasonable efforts to process any change you make; provided, however, that requests to delete information are subject to Dentons’ internal reporting and retention policies and all applicable legal obligations. International Transfers. We are an international practice and your data might be passed on to our international offices, some of which are in countries outside the European Economic Area, including the United States. Opt-Out. 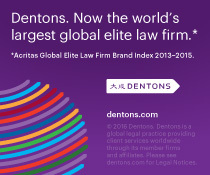 If you prefer not to receive any further communications, please email crm@dentons.com. If you have signed up to receive alerts using Campaign Monitor, you may unsubscribe using the links provided to you by Campaign Monitor. Links. The Website may contain links to third-party websites. Dentons is not responsible for the privacy practices or the content of such websites.